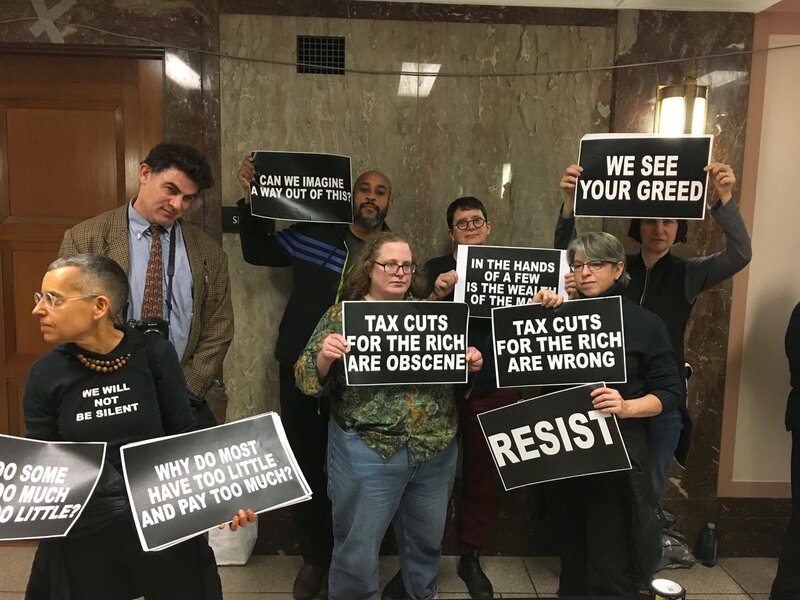 As the Senate Budget Committee debated the Republican tax bill on Tuesday before passing the proposal in a 12-11 vote, about a dozen people were arrested after disrupting the meeting to demand that senators reject the bill. The demonstrators chanted, “Kill the bill, don’t kill us,” repeating the refrain that was commonly heard in protests against the Republicans’ plan to repeal the Affordable Care Act (ACA) over the summer. Earlier this month, the Senate Finance Committee added a repeal of the ACA’s individual mandate to the bill, which the Congressional Budget Office estimated would leave 13 million Americans without health insurance. The revelation resulted in a huge push to defeat the bill by groups like Indivisible and other members of the Trump resistance, in recent weeks. At the Dirksen Senate Office Building on Tuesday, the Capitol police arrested about a dozen protesters as the committee voted along part lines to advance the bill. In addition to the impact the bill would have on health coverage, analyses by groups including the Tax Policy Center, the Joint Committee on Taxation, the Center for Budget and Policy Priorities, and Americans for Tax Fairness have all found that while middle class households may see tax cuts initially under the Republican plan, by 2027 most of the benefits of the proposal would be going to the wealthiest Americans. Republicans including President Donald Trump have also insisted that average American families would benefit from the repeal of the estate tax under the plan—though the tax only applies to transfers or inheritances of wealth over $5.5 million, and actually only affects about 5,000 American families. We need to keep the pressure up! #GOPTaxScam blatantly gives massive tax cuts to the wealthy and large corps while hiking taxes on 87 million working families. This scam must be stopped dead in its tracks. With the Senate Budget Committee vote cleared, the Senate is expected to vote on the bill as early as Thursday. Two Republicans, Sens. Ron Johnson (R-Wisc.) and Steve Daines (R-Mont. ), have said they oppose the bill, while nine others have expressed concerns. The president was confident that the GOP would be able to rally enough support, describing his lunchtime meeting with the party as a “love fest” in a press conference, and adding that he and Republicans in Congress have a shared desire to get the bill passed. Meanwhile, following its Day of Action on Monday, Indivisible urged progressives to target Sens. Susan Collins (R-Maine) and Bob Corker (R-Tenn.), both of whom indicated on Tuesday that some of their concerns regarding property tax deductions and deficit increases were being met in discussions, and that they were leaning towards supporting the legislation. Sens. Jeff Flake (R-Ariz.), Marco Rubio (R-Fla.), Mike Lee (R-Utah), and John McCain were also identified as Republicans who could vote against their party’s bill with enough pressure from constituents. MoveOn.org, Indivisible, and Organizing for America held events Tuesday at Senators’ offices and planned more demonstrations ahead of the expected Senate vote. This entry was posted in Austerity, Civil Rights, Corruption, Demonstrations & Protests, Economics, Government, Health Care, Human Rights, Income Inequality, Peaceful resistance, Social Justice, Solidarity, Women's Issues, Workers' Issues and tagged Capitalism, Civil Rights, Corruption, Economics, Health Care, Human rights, Income Inequality, Protests, social justice, tax reform, taxes, Women's Issues, workers' issues on November 29, 2017 by MNgranny.